Fast food is too convenient. When I'm busy or just lazy I tend to go for the easy route of going for fast food cause it's everywhere and too easily accessible. Do you have any tips to keep me from getting fast food? I know packing a lunch or bringing snacks can help solve this but I'm lazy. Any tips? You didn't say why you want to eat less fast food. If you've gained weight or just want to feel better, try any or all of these four suggestions. First off, I love fast food and eat at McDonald's once a week. I'm also good for KFC's regular recipe fried chicken and Taco Bell every month. 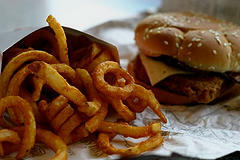 It's up to you whether you want to reduce or eliminate fast food from your diet. Just keep in mind, several good studies have shown it's not WHAT we eat, but the AMOUNT and FREQUENCY that's important for weight loss and health. 1. Continue to order what you normally order. Eat 75% of what you normally eat and leave 25%. You're still eating fast food, only 25% less. Which means you've reduced calories, fat and sodium by 25%. This works because portion sizes have increased so much in the last 20 years you can make modest reductions in the amount you eat and not miss it. See Portion Perversions for details about inflated portion size. 2. Select different menu items. For example, a McDonald's Big Mac, large fries and soft drink total 1,350 calories. A regular hamburger, small fries and drink total 590 calories. For a list of low calorie fast food menu items click here. 3. Build your own library of QUICK recipes. Stir-fry, sandwiches and other quick meals. Add one new recipe a week until you have a dozen or more that you like. The key is to find what YOU like. Restaurant (including fast food restaurants) meals can have 100-200 or more calories than the same food prepared at home. For example, a quarter pound cheeseburger from McDonald's has 510 calories. My homemade best hamburger recipe is a quarter pound with cheese and has 389 calories. The Internet has literally millions of recipes. Many include reviews, ratings and pictures. You can also find videos showing step-by-step preparations. Or, get a recipe book specializing in quick meals. 4. Eat breakfast. Donuts and poptarts don't count. A fruit smoothie made with yogurt and your choice of fruit, plus a good source of protein (eggs, handful of nuts, cheese toast, steak, etc.) will take 5-10 minutes and provides enough fiber and protein to get you going. You'll have much more control over what and how much you eat for the rest of the day. In fact, studies show people that DON'T eat breakfast are 4 times more likely to be overweight than those that do. If you eat fast food frequently you probably have problems with bowel movements. I eliminated my husbands difficulty with a morning smoothie. I'll spare you the details, but it gives him the needed fiber and the active cultures in the yogurt to eliminate his problem. He's a happy camper now! None of these suggestions are hard, difficult or time consuming. I think even a self-proclaimed "lazy man" will be able to use one or more to get the results they want. Excellent, thanks for writing in!